Running a half-marathon is not for the faint of heart. Those 13.1 miles require training, mental fortitude, and the perhaps insane belief that human beings were made to push themselves to the physical limit. Add in a 20-pound kid and a 20-pound-plus jogging stroller and you’ve got even more of a challenge. 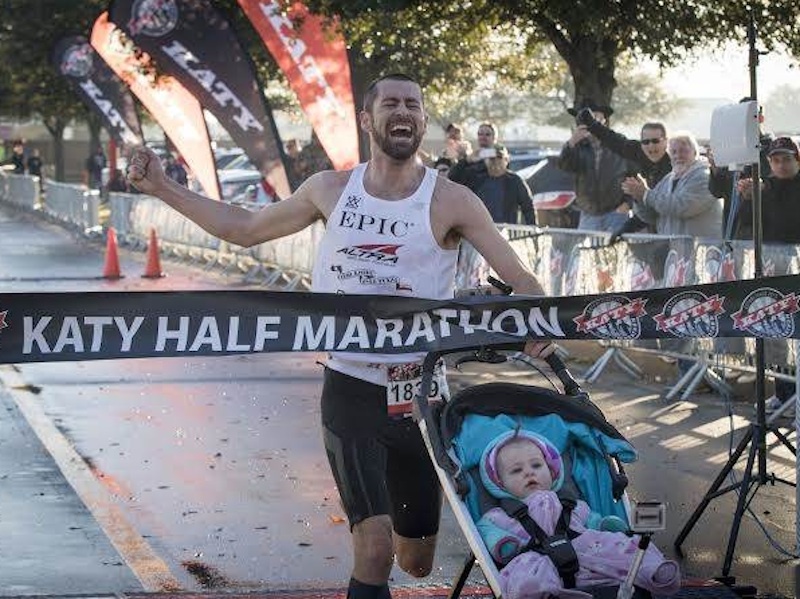 Dad and competitive runner Calum Neff took all this in stride as he won the Second Annual Katy Half-Marathon, setting a Guinness World Record for the fastest half-marathon while pushing his toddler in a stroller in the process. Shaving two minutes off the previous Guinness World Record breaker’s time, Neff and his 11 month-old daughter ran a 1:11:27 marathon on February 6th. His daughter’s relaxed face reflected the fact that she thought this run was NBD — both she and her three year-old sister have become accustomed to accompanying their Dad while he trains. Neff, who has completed several ultraruns and races that sound way more taxing than even the typical half-marathon says, “The stroller gives mom a break and gets my girls outside which they love. I wanted to show that being a Dad and running competitively can both happen, and to promote people to get out with their kids.” Spoken like a true multitasker! We might not have any world record breaking aspirations ourselves, but this news is definitely encouraging us to dust off the jogging stroller (as soon as the snow melts) and get going in the great outdoors for the benefit of the whole family. Running a half-marathon is not for the faint of heart. Those 13.1 miles require training, mental fortitude, and the perhaps insane belief�that human beings were made to push themselves to the physical limit. Add in a 20-pound kid and a 20-pound-plus jogging stroller and you've got even more of a challenge. 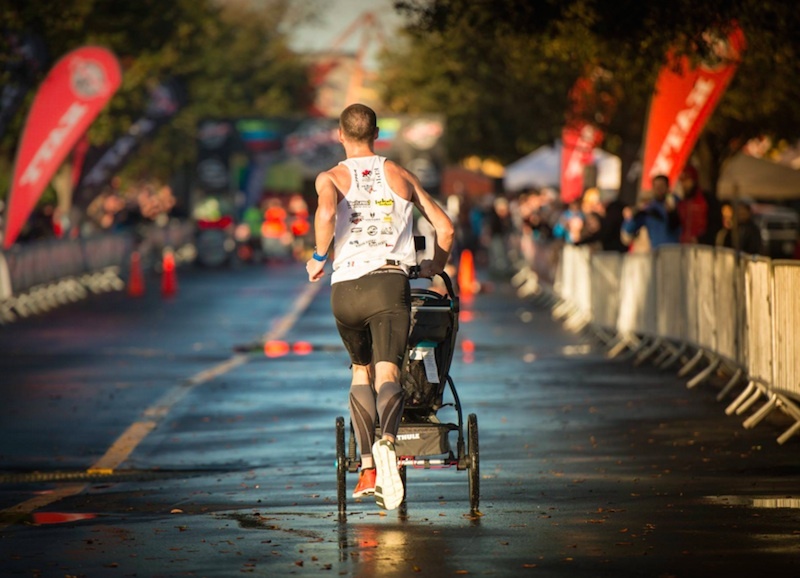 Dad and competitive runner Calum Neff took all this in stride as he won the Second Annual Katy Half-Marathon, setting a Guinness World Record for the fastest half-marathon while pushing his toddler in a stroller in the process. Shaving two minutes off the previous Guinness World Record breaker's time, Neff and his 11 month-old daughter ran a 1:11:27 marathon on February 6th. His daughter's relaxed face reflected the fact that she thought this run was NBD -- both she and her three year-old sister have become accustomed to accompanying their Dad while he trains. Neff, who has completed several ultraruns and races that sound way more taxing than even the typical half-marathon says, "The stroller gives mom a break and gets my girls outside which they love. I wanted to show that being a Dad and running competitively can both happen, and to promote people to get out with their kids." Spoken like a true multitasker! We might not have any world record breaking aspirations ourselves, but this news is definitely encouraging us to dust off the jogging stroller (as soon as the snow melts) and get going in the great outdoors for the benefit of the whole family.